I took several steps in late April 2011 to create and maintain a vegetable garden in my backyard. This included preparing the land, planting different varieties of vegetables and herbs, and looking after the garden almost every day. The back of my home has a southern exposure. This allowed me to pick a spot close to the house. I decided to take out a row of eight-year old shrubs and build the garden in this spot next to the house for easy access. 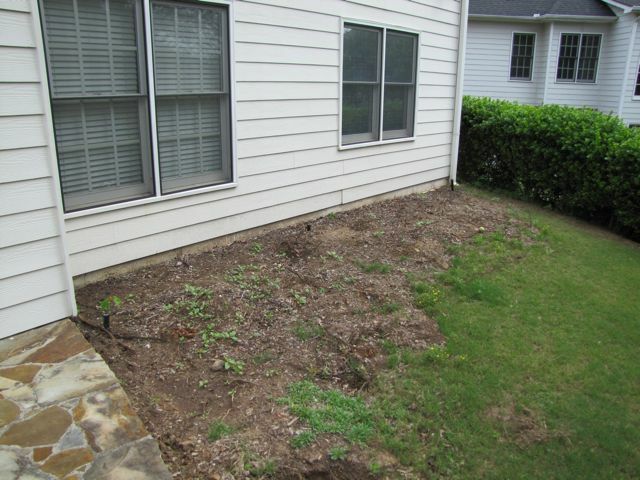 I removed roots and grass and tilled the existing soil. I added a few bags of compost to augment the soil. I used 8-inch wide lumber to create a border and buried it partially in the ground. I decided to use untreated lumber because of the risk of chemicals in treated lumber seeping into the soil; it was difficult to assess the risk either from the staff at the lumber yard or through online sources. I contacted my termite control company and confirmed I could use untreated wood near the house, as termites are a problem in Georgia. I also put a fence around the garden as there are rabbits and chipmunks that appear often in the backyard. 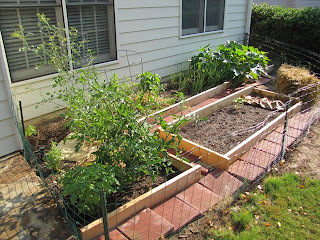 I was pleased with the first three weeks of growth that I added a new section to the garden and planted one cucumber plant and seeds for radishes, romaine lettuce, and beans. Most plants did very well, the exceptions being the yellow squash plant and the cucumber plant. The seeds, however, did not germinate. There were very few insect problems all year, and no pesticides were used. My fiancée and I watered and looked at the garden every single morning and delighted at each harvest. Here is a picture of the very first harvest -- a beautiful zucchini. 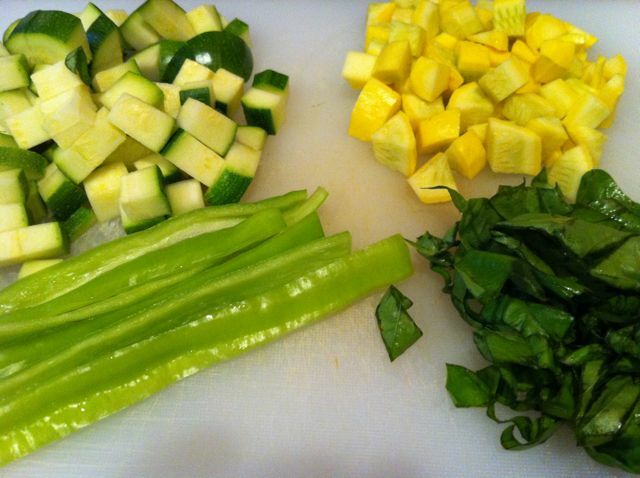 We used the produce in much of our cooking throughout the summer. We kept track of our costs and our harvesting throughout the year. 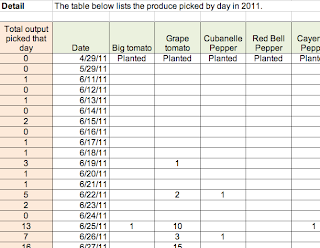 You can view summary and detail cost and output information about the garden from this spreadsheet. The amount of money spent to create the garden in the spring was $237.34. Of this total amount, $149.70 was spent on construction of the garden, which includes the lumber, stepping stones, and fencing. This is a one-time cost that should last through several planting seasons, and therefore, only a portion of this cost should be allocated to this season. The total amount for the plants, fertilizer, and soil totaled $87.64. 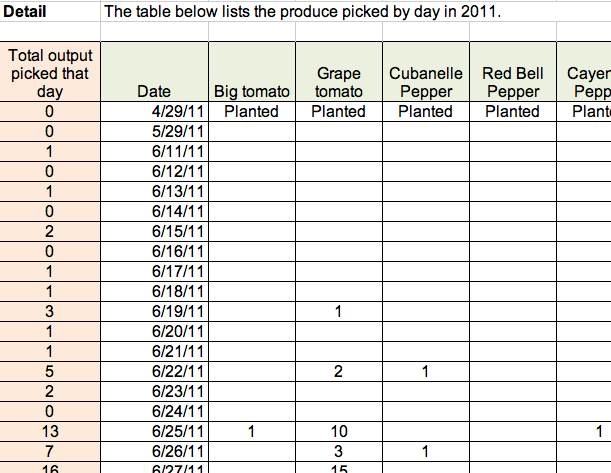 The number of individual produce items harvested during the year totaled 517, not including herbs. A large portion of this amount was from the grape tomatoes (227). By assigning a price per unit of each type of produce, I estimate that the total dollar value of produce harvested was $99.55. The price per unit is my own guess based on prices at the supermarket and the quality level. In most cases, I did not feel the quality level was as good as the supermarket variety in terms of looks and size, and I took that into account in the price estimation. The detail tracking of harvest by day allows a graph to depict the level of harvest over the course of the year and the harvest season by type of produce. Below are some of my key observations from my first season of vegetable gardening. While many of these observations may seem negative, these are learning experiences that can be used to set goals for next time. I planted the spring garden too late. I began planting at the end of April and should have planted a few weeks earlier. I believe I would have gotten a better yield of produce if I had done so. My goal for 2012 is to plant at the proper time. I do not believe I gardened effectively. A more experienced and knowledgeable gardener would have produced more vegetables in the same plot of land. He or she would have done a better job of fertilizing, watering, and maintaining the plants, for example, root pruning and removing the suckers from the tomato plants. My goal for 2012 is to seek out advice from experienced gardners to improve my skills so I can be more effective. I planted some of the crops in the wrong locations in the garden. For example, I planted a strawberry plant in the middle of the long bed. Strawberries are perennials and spread, and I think it would have been more appropriate to plant on the edge of the garden. I did not save money on growing my own produce versus buying similar produce in the store. My estimate of $99.55 of produce grown was less than the cost planting the crop ($87.64) plus some allocation of the construction costs (let's assume $50). Perhaps one could argue the cost of gas to drive to the supermarket was eliminated, but I went to the supermarket for other items anyway. I did not include any watering costs into the mix, which would increase the difference, although I think water costs were negligible. The use of store-bought plants contributed to a higher planting cost, but since I was only planting one of each, buying seed packets seems wasteful even if I started earlier. I do believe my late planting and effectiveness level lowered my yield and quality. The look and taste of the produce harvested were not measurably better than store-bought produce. Very little of the produce would have passed the "looks" quality inspection to be sold in the store. We also picked the tomatoes as they started to turn color so as to prevent splitting and potential damage from insects. 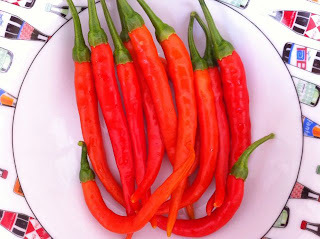 My goal for 2012 is to find out how to improve the quality and taste of the vegetables. Herbs are easy to grow and a perfect compliment to the vegetables. We used the basil, cilantro, and thyme in many of our dishes to compliment the tomatoes, zucchini, and peppers. We also dried the mint leaves and enjoyed mint tea (infusion) throughout the summer. It is enjoyable to watch the plants grow, flower, and produce vegetables. Gardening makes you more aware of mother nature. I remember when I lived in an apartment and had no lawn or plants to worry about. I wanted every day to be filled with sunshine and no rain so I could do outdoor activities. When I moved into a home and laid down sod, I became more personally aware of the importance of rain and looked forward to it. 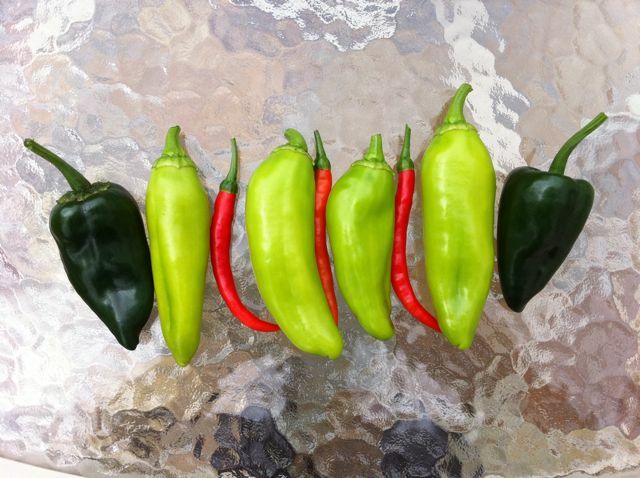 With vegetable gardening, I became even more acutely aware of the importance of weather (both sun and rain in proper proportions are good), good soil, and good plants. We can lose touch with our natural environment when we have little at stake. An edible garden requires regular maintenance, otherwise produce can be ruined and plants can change for the worse. Here are two examples for illustration purposes. 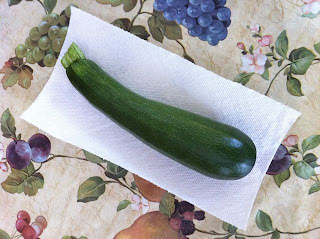 We had an overgrown zucchini (11 inches long) I had overlooked for two days before I saw it. It was still good, but it had many seeds. A zucchini plant almost needs inspection daily. We did not prune the basil and cilantro regularly. 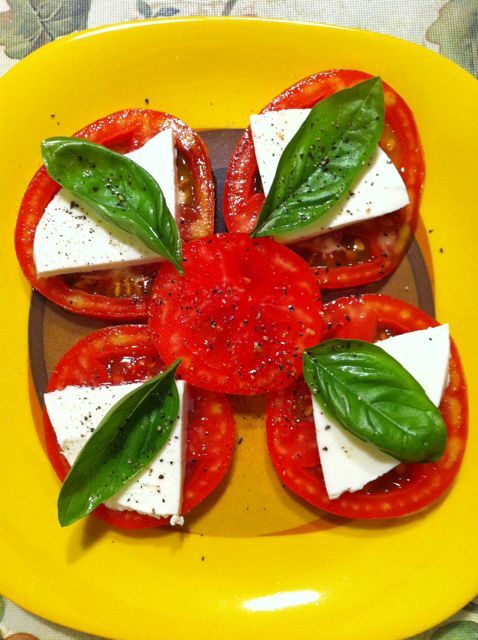 The basil plant eventually flowered, which changes the taste of the leaves. The cilantro eventually seeded (these seeds are coriander) and the cilantro leaves disappeared. In hindsight, I wish I had considered edible gardening as a key part of the original landscaping design. In 2003, I spent a material amount of money for a professional to landscape my backyard with a curved wall, a few trees, several shrubs, and a lawn. 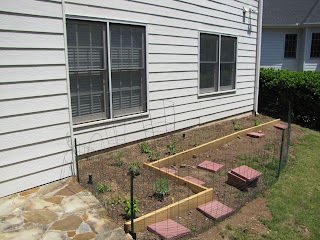 For the same amount of money (or perhaps less), I could have planted a few trees with edible fruit, built a set of raised garden beds for vegetables and herbs, and installed an efficient watering system for a garden. In addition, each year I spend time and money mowing and maintaining the lawn and shrubs, which could be spent on maintaining an edible garden. Through my experience I found connections between edible gardens and topics such as obesity, economy, food prices, medical care costs, organics, and locally grown foods. Others have already made these connections and are doing something to make a positive impact on these linkages. The bottom line is through good gardening and personal effort in your own backyard garden, you can make a positive difference in each of these areas for your own life. Check out this article in WedMD on exercise benefits and this article from the Centers for Disease Control on the health benefits. I identified several obstacles many people would need to overcome in order to have their own edible garden and achieve the benefits. Edible gardening takes work up-front to build the garden properly and work throughout the year to maintain the garden for high yields. It also requires knowledge and skill to do it well. Two of the many ideas I have considered I will briefly mention. "Barn raising" a vegetable garden. Barn raising is an activity where the community comes together to assemble a barn for one or more of the households in the community. This makes the process more efficient and more cost-effective. There are many people who have land in their backyard, but not the muscle and the time to get a decent-sized garden started properly with raised beds, good soil, the removal of existing trees and shrubs, and the installation of good infrastructure such as watering systems. A "barn raising" approach could be used to overcome this obstacle and large task and make it into a weekend activity. If this approach could be combined with a Habit for Humanity type of organization of a few knowledgeable individuals, a large contingent of volunteers, and committed homeowners to maintain the gardens, the number of productive gardens in backyards could grow substantially. Practical education in the sciences of biology, botany, ecology, agriculture, meteorology, nutrition, and chemistry. Responsibility in planning and managing time and resources, and then seeing real rewards of good planning and work. Analysis and problem solving skills to handle real-life issues such as disease, pests, weather, and weeds. Experience and skill in growing vegetables and maintaining a vegetable garden that they can apply at home. Possibly healthier nutrition in the school cafeteria if there is sufficient produce to integrate into the offerings at different times during the school year. There are many examples of this idea in action. One example is the Edible Schoolyard Project. The associated Foundation envisions a public school curriculum that includes hands-on experiences in school kitchens, gardens, and lunchrooms, and that provides healthy, freshly prepared meals as part of each school day. It started an edible garden with a public middle school in Berkeley, CA, USA. In addition, teenagers would obtain the skills to provide some services to neighbors who need help in maintaining their edible garden. I love this blog. Home vegetable gardening contributes to the sustainability of the environment. On top of that, no food can be more satisfying than the freshly pick home grown vegetable and fruits. My first vegatable gardening experience actually was at high school, where we had a small garden just outside our classroom, wasn't that cool? I'll plant more cucumbers this coming spring.